It’s hard to believe this Motivation Monday brings us exactly two weeks away from Labor Day. Most consider the holiday the unofficial end of summer. As I sat on the beach on the last day of my last vacation of the season, I realized how much time can be wasted thinking about how many hours or days we have left to enjoy something instead of seizing and savoring the present moment. I stared at the roaring sea, listened to the waves crashing against the sand and started breathing a little more deeply. I wanted to savor the scent of salt and sunscreen and embrace the feeling of the heat on my sun-kissed skin. However, somehow the my-vacation-is-almost-over panic crept in to my head and in to my heart. Panic about the future. Back in the concrete jungle. Back amidst the cacophony of sirens and horns. Back amongst the crowds of students on the subways and more people in the streets. I know I’m not alone in this constant struggle between living in the present and worrying about what’s to come. As my mom pointed out, how can we not project about what’s two days or two weeks in the future when we’re bombarded with back-to-school sales in June and Christmas promotions in July? And I did smile. I realized how fortunate I was to be back in Montauk with my parents after last year’s hiatus because of my father’s emergency heart surgery. I realized the ocean will continue to churn and then settle into a calm, just like the different seasons and stages of life. At some point, each of us may face the end of a vacation…a job…a marriage…a life. My goal as I move toward a new season is to remember it’s healthier for the body and the spirit to hold on to what was good than lose sleep and sanity over what went wrong and what we can’t get back. So when life seems overwhelming, I will close my eyes and envision the mighty sea to give me the energy I need to keep going. Whatever gives you strength- a good workout, an image of your children laughing without a care in the world, a conversation with your best friend – enjoy as many of those moments as you can this week and in the weeks ahead. We can’t change the fact that time will always march forward. But savoring the only thing we have control over in that journey – the present moment – can help us take on life’s challenges while keeping us on the course to have fun, be fit and feel fabulous! 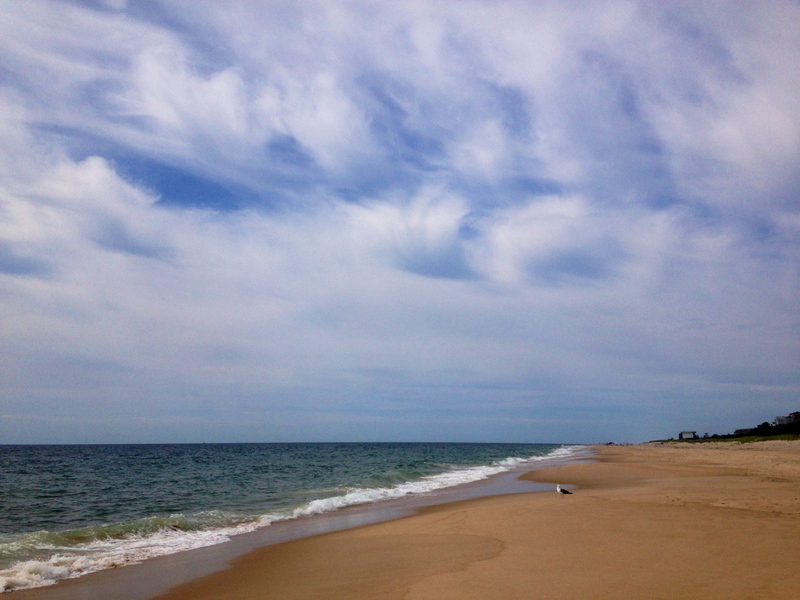 Posted on August 18, 2014, in Health, Vacation and tagged Beach, Dr. Seuss, Laura DeAngelis, Living in the Moment, Mental Health Break, Montauk, Personal Fitness, Power of Positive Thinking, Summer, Vacation. Bookmark the permalink. Leave a comment.